Bay Adelaide Centre East, located on Adelaide Street West between Bay and Yonge Streets, adjacent to Bay Adelaide West, will be a 44-storey, 980,000-square-foot office tower with best-in-class operational, environmental and life-safety systems. 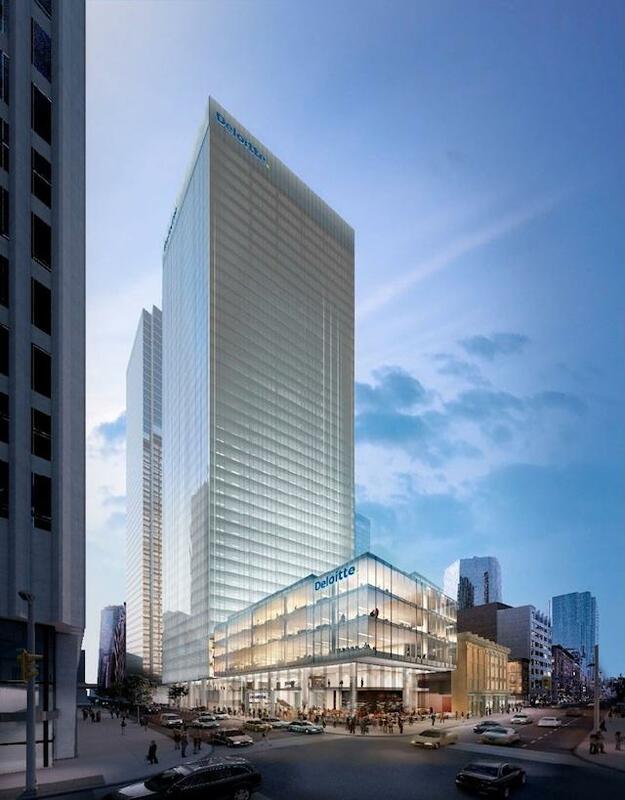 Once completed, the East and West towers will represent the forefront of premier office product in Toronto’s financial core, encompassing the full Adelaide Street block between Bay and Yonge Streets. Consistent with Bay Adelaide Centre West and all of Brookfield Office Properties’ new developments, Bay Adelaide Centre East will be built to a minimum LEED CS – Gold environmental certification. The East tower’s expected completion date of late 2015/early 2016 coincides with several large office lease expiries in the financial core and gives these firms a new, premium build solution in a coveted location. The building will have direct access to subways and the amenities of the PATH underground pedestrian system. The commencement of Bay Adelaide East is conditional on obtaining certain municipal approvals. The 51-storey, 1.2-million-square-foot Bay Adelaide Centre West opened in 2009 and is 95% leased. At the time it was developed it was the first new office tower in Toronto’s financial core in 17 years. Completed on-time and under-budget in June 2009, Bay Adelaide Centre West was Toronto’s first LEED® Certified Core and Shell Gold high-rise office building. Bay Adelaide Centre is anchored by prestigious legal and accounting firms and is considered ‘the centre of business’ in Toronto, representing a new standard for premier "AAA" class commercial properties. Integrating past and present, Brookfield was the first developer to successfully incorporate the historic National Building façade at 347 Bay Street into the stunning design of a premier 51-storey office property. The sophisticated and contemporary ground floor lobby is vibrant and spacious, approximately 3 stories tall, with an abundance of natural light. The south wall of the lobby features a light installation designed by Arizona artist James Turrell, who has been recognized with prominent awards such as Guggenheim and MacArthur fellowships. With concourse retail providing the final link to the underground PATH pedestrian walkway, the Centre features a ½-acre urban plaza and 1,100 stall parking garage with entrances on both Adelaide and Richmond Streets. Gingko trees and ornamental grasses frame the benches and open area in the adjacent Arnell Plaza, allowing a pleasant respite for visitors. Life safety features, such as stairwells 20% wider than Ontario Building Code requirements, blast resistant glass for the bottom 11 stories and control collapse columns represent an understanding of design challenges in today’s security-conscious environment. The 51-storey West Tower was designed by WZMH Architects with KPMG as its lead tenant. The 44-storey East Tower is designed by KPMB and Adamson Associates with Deloitte as its lead tenant. In addition to Bay Adelaide Centre East and West, the third and final phase of the development – Bay Adelaide Centre North – can accommodate additional new development of approximately 500,000 square feet. Engineering: Entuitive, The Mitchell Partnership Inc.